Although the best known fossils of dinosaurs are fossilized body parts such as bones, teeth, horns, skin, feathers, scales and fossilized soft body parts, the dinosaurs also left many trace fossils (technically known as "ichnofossils") which show their activities during life. Trace fossils include gizzard stones (stones swallowed to assist in digestion), dung (technically known as "coprolites"), nests, burrows, toothmarks, and footprints. Dinosaur footprints, and tracks containing multiple footprints can tell scientists a lot about dinosaurs. In some cases, this may allow scientists to confirm information they already know (for example, if fossilized bones suggest an animal walked on four legs, this can be confirmed by its footprints), but in other cases, scientists may discover new facts about dinosaurs from their footprints. 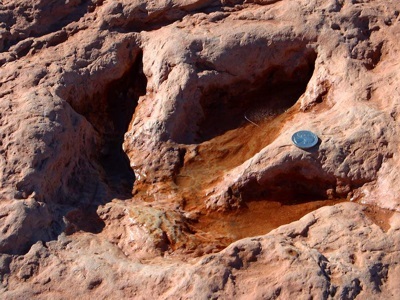 Dinosaur footprints can tell us about the shape of the particular type of dinosaur's feet. From the depth of the footprints, we may be able to estimate this type of dinosaur's weight. 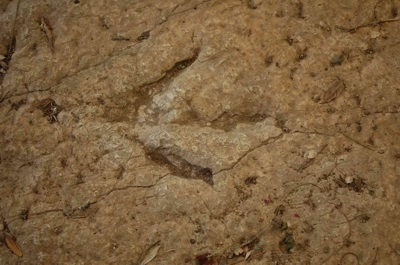 If there are a series of footprints (known as "tracks" or a "trackway"), we can tell whether this particular type of dinosaur walked on two legs ("bipedally") or on four legs ("quadrupedally"). If there are a series of footprints, we may able to determine information about this particular type of dinosaur's gait, and the speed at which it was moving. If there are a series of footprints, we can tell whether the particular type of dinosaur was travelling alone or in a group. If we find footprints from a group of several animals travelling together, we can determine whether that group only include animals of approximately the same age, or a mix of adult and juvenile animals. Dinosaur footprints have been found at many different locations around the world, including a major find that was made in 2009 in the Jura Mountains near Lyon, France.